A lightly-regarded sixth-round draft choice by New England in 2000, Brady got his chance when starting QB Drew Bledsoe was injured in the second game of the ’01 season. With the young quarterback showing surprising poise and leadership ability, the team surged in the second half and ended up with a stunning win over the St. Louis Rams in the Super Bowl. Brady was selected to the Pro Bowl. Patriots went 9-7 to finish second in the AFC East. The Patriots followed up with NFL Championships in 2003 and ’04. 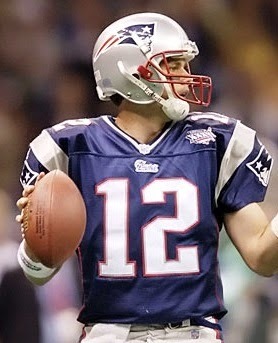 Brady was selected to the Pro Bowl in 2004 and ’05, the latter year in which he led the league with 4110 passing yards. In 2007, Brady passed for a NFL-record 50 TDs while also leading the league in passing yards (4806), completion percentage (68.9), yards per attempt (8.3), and passer rating (117.2). He was a consensus first-team All-Pro for the first time as well as league MVP and the Patriots went undefeated in the regular season – however, they were upset in the Super Bowl by the Giants. Brady’s 2008 season ended prematurely due to a knee injury in the opening game. He came back to throw for 4398 yards and 28 TDs in 2009 and had another MVP season in 2010, in which he led the NFL in passing (111.0 rating) and TD passes (36). Brady passed for a career-high 5235 yards in 2011 and the Patriots won another AFC Championship, although they came up short in the Super Bowl. His outstanding play, and durability, continued through the next three years as he passed for over 4000 yards in each. The Patriots capped the 2014 season, in which both Brady and the club got off to a slow start, with a victory in the Super Bowl over Seattle. Brady was selected to the Pro Bowl in every season from 2009 through ’14, giving him a total of ten in all. Thus far, he has passed for 53,258 yards and 392 touchdowns, both figures ranking fifth all-time, against only 143 interceptions, with a completion percentage of 63.5, an average of 7.4 yards per attempt, and a passer rating of 95.9. In the postseason, he has thrown for 7345 yards and 53 TDs, with 26 interceptions, and the Patriots have compiled a 21-8 record in his starts that include four Super Bowl wins against two defeats.